A designer reveals her decorating secrets, noting that comfort and convenience can make your home even more livable. Is the path to your kitchen worn out because it's where your family spends most of its time? If so, then you are just like Susie and Ben Allen. "We've decided this is all we need. We just go from the kitchen to the bedroom and back every day," says Susie. With a spacious cooking area connected to a small sitting room that doubles as a dining area, the Allens' kitchen in Jackson, Mississippi, is one to envy. But it didn't happen overnight. 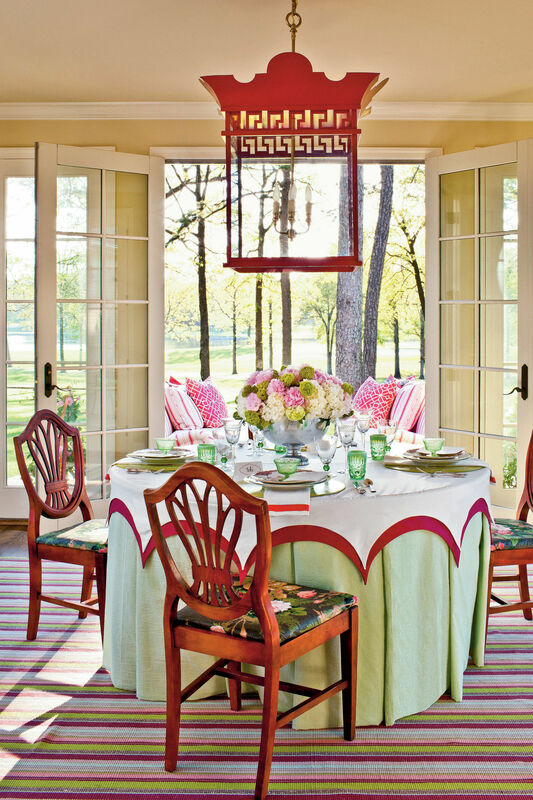 Designer Ann Carter used five key strategies that combine comfort, convenience, and ideas adaptable to any setting. Maybe they will inspire the same success at your home. As the old saying goes, "If it isn't broken, don't fix it." The same is true in this kitchen tune-up, where cosmetic improvements were made without removing any walls, windows, or other original fixtures. White cabinets and countertops have classic style, but the rest of the room required a personality overhaul to suit this family's needs. Overall, the kitchen was in good condition with a practical floor plan. It was open and spacious with room for a typical dining area opposite a well-organized workspace. The large window overlooks a lake, so enhancing views and capitalizing on natural light were a big part of the update. Use fabric for unity and color. Because the area was mostly white and sleek, Susie wanted color to turn it into a warm, cheerful room. Ann chose a multicolored toile fabric that feels happy. "With toile, sometimes more is better," says Ann. She dressed three window treatments and two comfortable chairs alike for impact. The fabric and the lake view inspired the green wall color. Accent furniture, such as the buffet deux corps, adds character. The buffet is a focal point because its aqua paint finish contrasts with the simplicity of the white trim, cabinets, and countertops. Dishes displayed on shelves provide additional color, texture, and personality. Although open in design, the kitchen didn't have room for a dining area and additional seating--or so the Allens thought. "I enjoy having people in the kitchen with me," says Susie. "Ben didn't want to come home after a long day and curl up on a barstool." So Ann placed two cozy chairs to view the lake. Ben and Susie usually eat at the bar, but they can also enjoy a meal in front of the window by flipping up a leaf of the table. "With their sons away at college, it's the perfect setup," explains Ann. She centered the chandelier in the room to have light above the table when it is pulled out for a dinner party. Combine decorative details with function. Each window treatment was designed to suit the specific window and its function. Operable shades were hung on each French door. Curtains and a valance were made to frame the large window in the dining area, while another valance, a smaller version of the large one, brought similar color and style to the window above the sink without eliminating light. 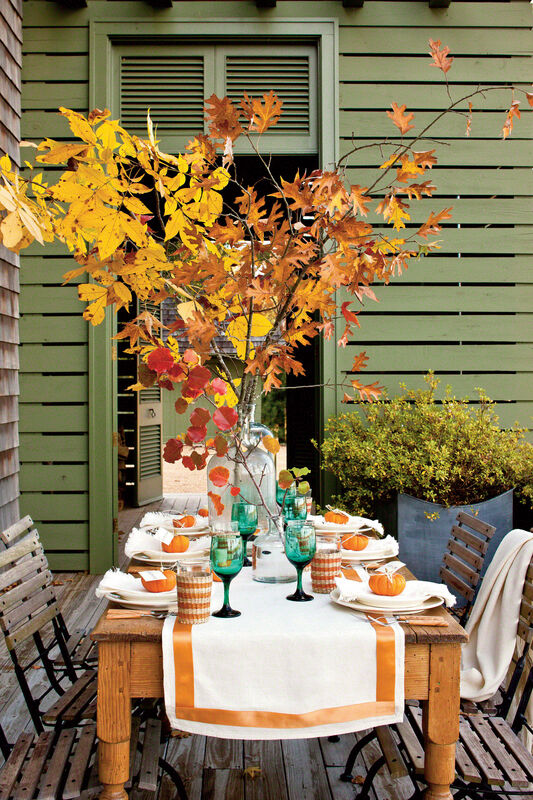 The rolled cushions designed for the dining chairs provide extra color and comfort. Layer textures for warmth and character. The kitchen work area felt very confined and too sleek. "It needed a little weathering," Ann says. She chose tumbled marble tiles for a textured backsplash and used an antique iron-and-marble-top pastry table as an island. She also replaced some of the solid cabinet doors with glass fronts to highlight Susie's collections and to open up the area. Even the glass has a texture. "Layering is important because the mix makes it much more personal," explains Ann.